View sketch page for source code, Windows, Mac and Linux executables. A small application made with Processing to produce MIDI control messages from a live audio feed. Auto-levelling frequency band meters are used to obtain “peak” output values across the entire audio spectrum analysed (whereas it is usual to have strong bass response with weaker treble response), and easing is applied to make the levels less erratic. 10 separate monitor outputs are supplied, where each monitor is attached to one of the frequency band meters and that meter’s output is scaled to the particular output range for the monitor, allowing for a reduced final output range as well as inverted ranges. Controls are provided to select the MIDI output device and the MIDI channel to use, as well as for selecting which monitors are connected to which meters and the monitor output ranges. View sketch page for source code. 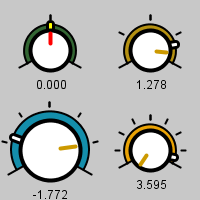 A GUI knob that allows multiple revolutions. A mouse follower… with another dimension. Exercise creating a class for the chasing objects, exercising PVector methods for the motion calculations. This program is an optimisation and modification of the fabulous Origami Butterfly by Kyle McDonald, which in turn is a modification of the Origami Butterfly Method by Jonathan McCabe. 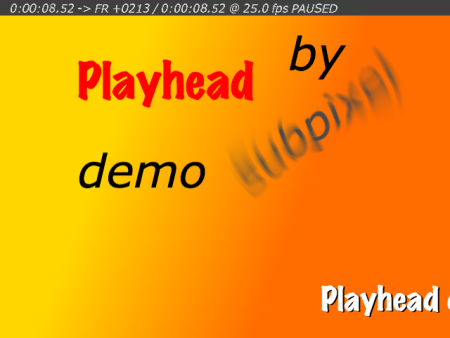 The modifications to the implementation resulted in a massive speed gain (about 3x the original), enough to have “smooth” animations instead of one still image every two seconds. The “animation” I have done is pretty basic, and might be extended in future to animate more than the last fold, or to animate that fold in some other manner. I’ve been thinking about adding pointy bits to some 3D models, instead of making everything from boxes and/or spheres. Maybe still a bit boxy (eg a square pyramid), but maybe also some nice cones. I saw a while back that one of the geometry-creating modes was a triangle fan, which looked perfect for making cones and pyramids. Clearly, having just one cone is n’t enough, so I made a spiky ring whcih went through various changes (with varying animations) until I arrived at this. I quite like it when the “cones” drop down to having only 2 sides, so they are then just flat. Maybe a bit boring if just a triangle, but the arrangement of base-to-base cones here instead leaves a rather pleasant kite shape, reminding me of a blade, perhaps. When there are heaps of them – more than would at first seem sensible, a nice rippling/fluttering effect occurs. 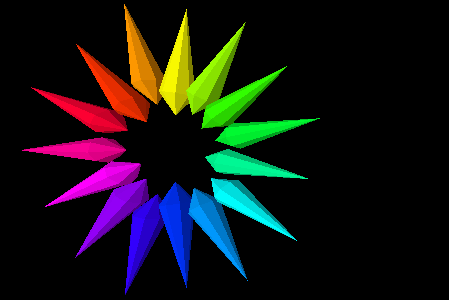 Overall it reminds me of an assignment I had in a class on colour to make a colour wheel – the name ConeWheel being a reference to that. I’m surprised at how fast this runs in the P3D mode (faster than OpenGl in this case? ), even with a seemingly large number of “cones”. It is more bright and cheery in P3D mode at any rate, and was chosen to allow posting to OpenProcessing.org. View sketch page for source code. Please note that the sketch itself appears to freeze after only a second or two of runtime. Please try building the program yourself in the Processing IDE – you cannot save files from the applet in any case (this is a video frame generator). set to match the frame time. I saw Johan’s video generator program and was interested to find out what made it tick. I really should have written something like this last year when I had a need for supplying lyrics for music at parties… I’d had a bit of an experiment in another direction, using custom HLSL pixel shaders in the Neon v2 VJ software I use, but that proved to be painful and not especially useful! Anyhow, when I looked inside the hamstergyro, aside from the world of pain of setting up those hundred or so timed lyrics entries, I saw that the method use to calculate the animation was a bit confusing and awkward. My first thought was to post a comment recommending Johan check out the lerp() and lerpColor() functions for future projects, and started typing some example code in the comments box to show how nice it might look in comparison. In all, I’m pretty pleased with the result so far, and I’d like to thank Johan for the inspiration – seeing something done is sometimes all the motivation you need to go out and try it yourself. Splitting this sketch into separate files proved a little troublesome. At some point the compiler told me that there was a duplicate of something (a static final int), when I’m certain there was only one of it… Remove the “offending” lines and the next thing is then flagged as a duplicate. I couldn’t figure out what the problem was, so tried cut’n’pasting the files back into a single file again. Seems to be okay (well, there were other problems, like a null pointer exception, but it didn’t fail on the compilation at least!). Closing the sketch (I’m not sure if exiting Processing altogether) and opening it again laster made the problem mysteriously disappear… A gremlin in the system somewhere no doubt. Well… I managed to pull the monolith into smaller many-liths, and added a bunch of new features. I think I spent most of the time staring at the screen and twiddling the knobs to see how it looked and worked. There was some great music playing on some net radio station found in an iTunes playlist – maybe getting a bit carried away with that, but a good sign for playing out later. 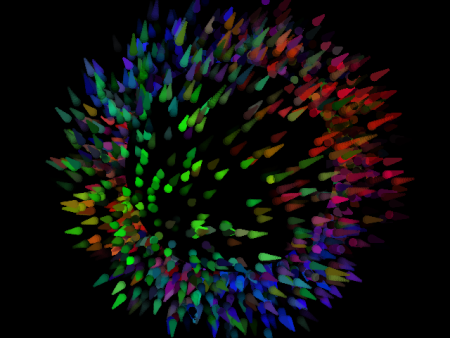 I now have a system (of sorts) where I can add a new “effect” and have it fired by the random effect button… I made a couple of samples and they don’t necessarily look that nice. One of them started as something basic, led to another step and another step, until it was helicoptor blades spinning above the central box. 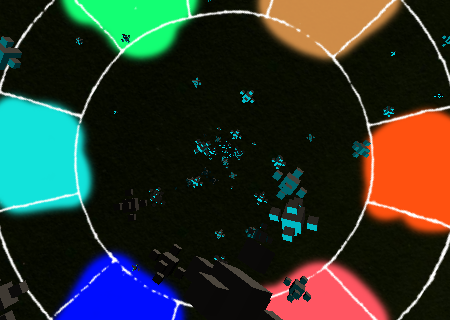 Looks kind of okay at first, but when you have a lot of objects on screen (especially if there are a lot of ‘coptors! ), it just looks bad. Too vicious. Too much fast movement. Well, the framework is there, now time to do something more interesting with it. There is another (major?) part to be started yet, and that is the beat synchronisation stuff. I haven’t written/drawn anything about it, and should probably do that before putting finger to button to code it. I might have a look inside the MIDI library for ideas on how to build a sequencer, and also have a look at the Mother library for combining multiple Processing sketches using OSC (Open Sound Control). 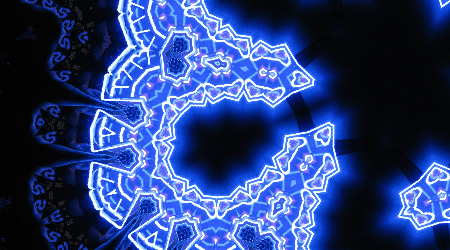 That reminds me, I wrote a sketch last week or something that allowed me to control Neon V2 via MIDI. I used an X-Y rectangular region to send two signals to one of my custom pixel shader effects, and by that was able to control the positioning of a graphic effect on-screen using my Wacom tablet. Neat! Well, there was one problem, and that was that the reaction time was somewhat delayed. 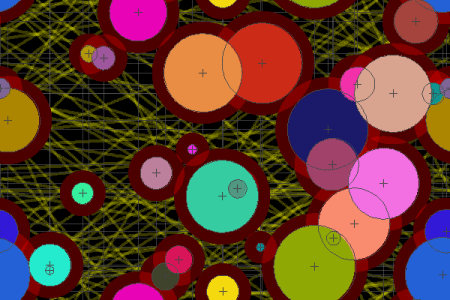 I don’t know if my PC is up to the task of running a Processing sketch whilst generating visuals with Neon. Maybe if I reduce the screen updates from Processing the load will be lighter, but it seems at the moment that it isn’t really viable. Setting up the MIDI listening in Neon is especially problematic, since when you select MIDI control it latches on to any and all MIDI messages coming in on a certain channel (not sure if that is the correct terminology), so if there are two signals you have to chance it to get lucky that it picked the right one at that split second. In case you’re wondering, the screenshot for SpaceBoxes v1.2 above isn’t doctored, but it does include a nice graphic from another adventure in the background! Instead of just the partly coloured (and colour-inverted) colour wheel image, there are now a small group to choose from (well, cycle through by pressing SHIFT-B). 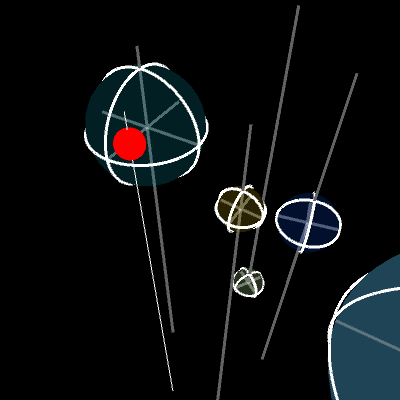 Another Processing sketch, this time with some boxes flying out of the screen at you… a little like an asteroid field, only super boxy. I’ve included a 2D image in the background as well, and it all swirls around almost dizzyingly… I don’t know if there is a better way to just have the 2D image as a backing layer with the 3D drawn over the top. I had to move the “camera” and objects so they weren’t hidden by the 2D image plane. Well, despite any problems, it is my first submission on OpenProcessing.org, which has a lot of cool sketches posted by others. It shall also go into my box of tricks for an upcoming gig: Immersion at The Flea-Pit on Columbia Road in February. Edit: versioning has bitten me again… I wanted to update the program on OpenProcessing.org, had it working nicely, then went too far! Started on more extensive changes that will take a bit more time and thought, and could possibly break everything. Perhaps I should fork every time I have it in a working state, or at the very least when I publish online.